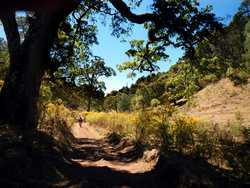 Trails near the Highland Hermit’s cabin are picturesque and often suitable for mountain biking. 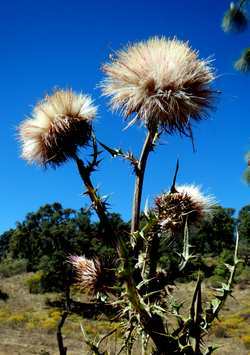 St. Benedict Thistle (Cardo Santo) flourishes at around 2700 meters in western Mexico and is of much interest to herbalists. 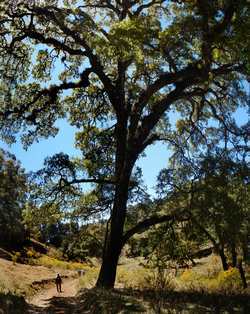 Like those thistles, oaks in this area tend to be extremely tall. The local dam is running out of water. 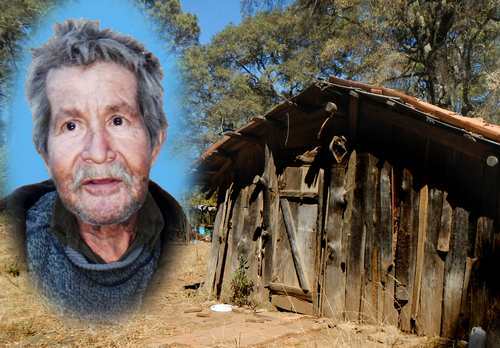 Many years ago I heard a rumor that there was a “Man of Letters” living in the hills near Atemajac de Brizuelas, high above the salt flats of Sayula,about 75 kilometers southwest of Guadalajara, Mexico's second-largest city.. “His name is Alfredo and he’s been living in a cabin all by himself for 15 years,” a friend told us. 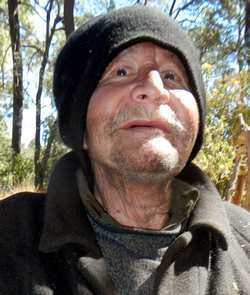 Curious to meet a modern hermit, we climbed a bumpy dirt road to a lonely area full of tall pines. At an altitude of 2700 meters, we came to a small, rustic shack. 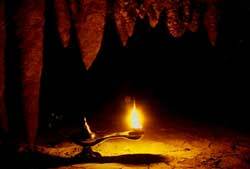 It was the home of Alfredo the Hermit, alright, but he was hardly alone. Seven or eight visitors were seated with him on stumps and logs behind his cabin and—it was hard to believe—they were all engaged in a lively discussion of the Nature of Time. 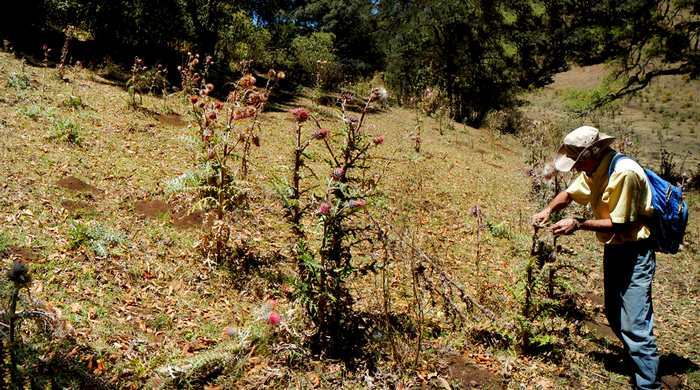 We were invited to join in and later enjoyed listening to the haunting melody of the quena, the “flute of the Andes,” played by one of the guests, until it grew dark and very cold, even though we were in the middle of May, traditionally Western Mexico’s hottest month. This was such an impressive experience that, sixteen years later, I found myself wondering whether Alfredo was still up there pondering the great truths of life in the cold mountain air. Finally I began hunting for his lonely wooden cabin, whose location was now only a hazy memory. Thanks to the help of friends willing to participate in my craziest schemes, we searched all along the road to Atemajac and discovered marvelous places like “the No-Longer-Balanced Rock,” the Amor Corazón Restaurant and the Zero-Gravity Hang-Glider Launch Pad (all described in my column in the Guadalajara Reporter) but when we asked about hermits, not a soul had ever heard of good old Alfredo. 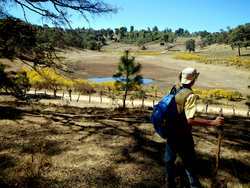 My mistake was never consulting my friends in Jalisco’s oldest hiking club, CEO (Cuerpo de Exploradores del Occidente). Finally, weeks ago, I casually asked long-time CEO member Mario Guerrero if he’d ever heard of the Hermit of the Highlands. So it was that four of us squeezed into Mario’s truck last Saturday and followed a road out of Atemajac de Brizuelas that practically brought us to Alfredo’s doorstep, …er, well, to the adobe brick that serves as a doorstep. Along the way, my friend Gregorio Leñero spotted a plant on the roadside. Ten minutes later, we were at Alfredo’s cabin, which looked to me exactly the same as it had in 1997. Alfredo, however, had not proven as durable. Although his mind was still sharp and feisty, his body had not kept up and walking just a few steps, with the help of a cane, required all of his energy. Nevertheless, Alfredo told us he was content with his lifestyle and still working on knowing himself. A roaring campfire and good food kept us going for quite a while, but it soon grew so cold I had to head for my tent where I managed to warm up inside of two sleeping bags…until about 4 AM, when I actually had to insert my lower extremities—still inside the sleeping bags—into a giant plastic garbage bag. Hey, don’t knock it; that did the trick and I slept like a baby! The next day, after a hearty breakfast, we took a four-kilometer hike to a breathtaking mirador named La Cruz del Hermitaño, in Alfredo’s honor, of course. This walk took us through really tall pine and oak trees. The scenery along the way was gorgeous—even though we are just about at the height of the dry season—and the wide path we followed looked ideal to me for mountain biking. A short climb up a hill brought us to two freshly painted crosses and the always impressive view of the salt flats of Sayula far below us. Alfredo looked extremely dejected when it came time for us to say good-bye and we assisted him in slowly walking from his favorite chair (under the open sky) to his bed. “We’ll be back after the rainy season,” (during which these roads become extremely slippery), we told him. He said nothing, but the sad look in his eyes spoke volumes. Alfredo needs help, but given the life-style he’s decided to follow, I wonder what can be done. If you’d like to visit Alfredo or just take in the view from the Hermit’s Cross, follow the directions below, but note that the long stretch of dirt road between Atemajac and the community of École can become extremely slippery during the rainy season. From Guadalajara, take highway 54 southwest and follow the “libre” signs for Colima. 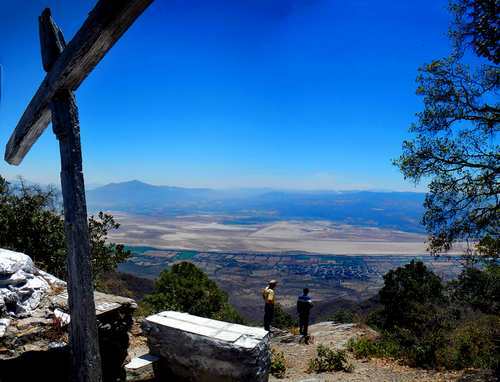 About 15 kilometers south of Acatlán de Juárez, watch for the turnoff to “Tapalpa via Atémajac.” Atémajac is 32 km to the southwest. At N20 07.951 W103 43.107, turn off the Atémajac road onto a dirt road signposted for École. Follow this road southeast for 7.5 kilometers. When you reach N20 05.963 W103 39.712, you turn left for École and right to head for the Hermit. After driving east 4.5 kilometers, you’ll come to the locked gate (N20 05.606 W103 37.469) not far from Alfredo’s cabin (which is at N20 05.594 W103 37.373). As for the Hermit’s Cross Lookout, hike or bike along a wide trail heading south and then east for around four kilometers. The cross is at N20 04.954 W103 35.876. Driving time from Guadalajara to the cabin: about two hours.